In a political climate where foreign influence in our country is being questioned, the London College of Fashion wears its multiculturalism like a badge of honour. 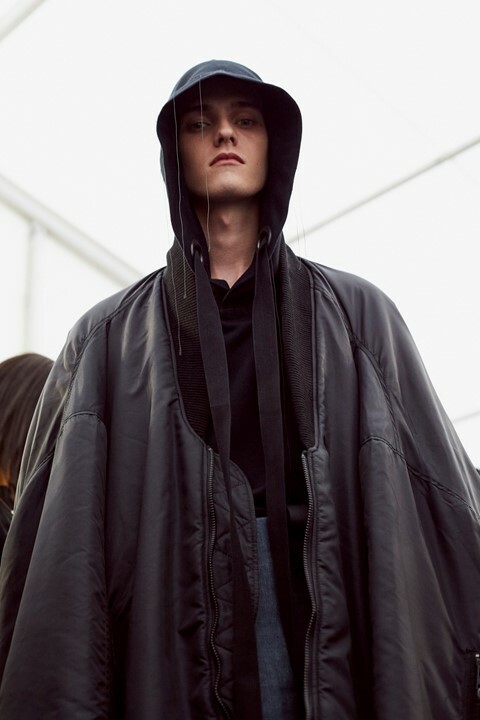 The show notes proudly proclaim that students of its BA Fashion pathway come from over 100 countries worldwide, and these far-flung backgrounds were wholly represented in a brilliantly diverse graduate show which riffed on Irish folklore, Belgian sculpture and Japanese takeaways. The school has a reputation for creativity – something which is reflected in its alumni list; J.W.Anderson and Ryan Lo (who was in attendance last night) both graduated from the respected institution and have since gone on to challenge the fashion industry with their forward-thinking ideas and singular aesthetics. Last night’s show also clearly demonstrated that collaboration is the key to success. Some of the most interesting collections were the brainchilds of designers working in collaboration; there was Gayane Arzumanova, whose deconstructed pieces were made of Beth Wilson’s textiles and topped off with Yiu Jiang’s sculptural headpieces, and Wei Yao Lin, who married his passion for takeaway cartons with Cheng Qian’s musings on a new generation of “human puppets”. It may be frequently said that fashion is in a state of flux, but these designers provide reassurance that the power of creative collaboration will never be stifled. Joseph Standish approaches his designs by sketching a series of characters and bringing them to life on the catwalk; there was the local window cleaner, there were lads on tour and there was the bloke in the local with a hole in his jeans. Standish previously worked at G-Star, a job role which imbued within him a passion for denim. “I love when denim is worn – like when a lad puts a paintbrush in his pocket every day and eventually there’s a hole there. 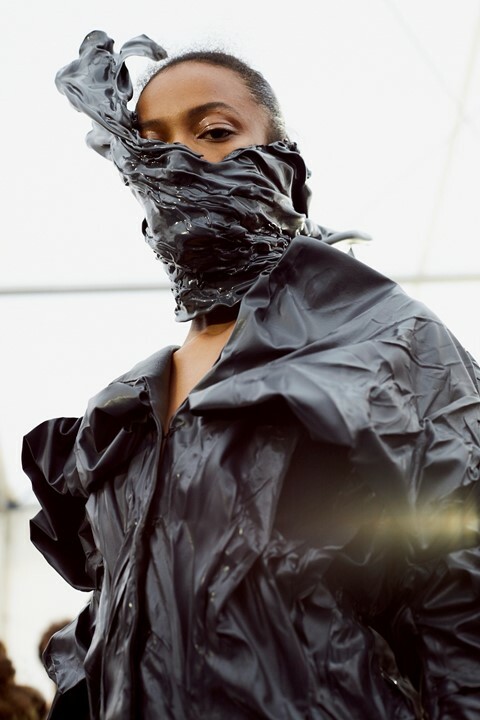 It’s about that natural relationship with clothing.” The designer also considered sustainability, using found and worn denim to eradicate the consumption of new materials and add a layer of authenticity to his collection. 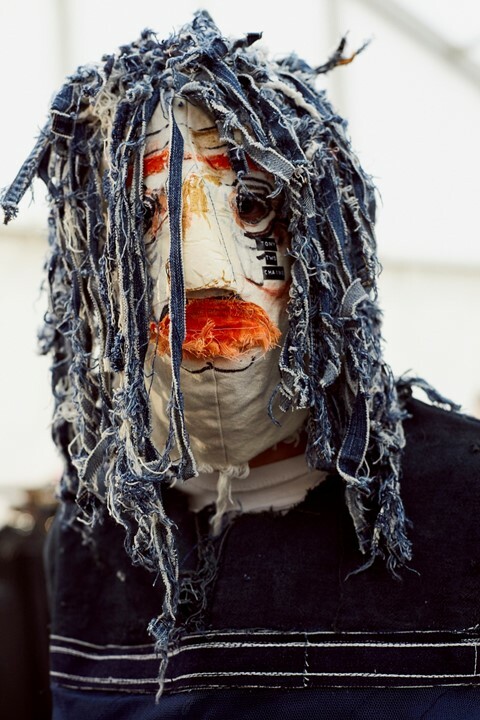 In a sense his pieces are 3D sculptures, systematically destroyed and unravelled to create results that represent the stories embedded within our wardrobes. When Wei Yao Lin and Cheng Qian first decided to work together, they found they had extremely different reference points. While Qian wanted to explore the way that humans were controlled in contemporary society, Lin was fascinated by the crazy colours and slogans of takeaway packaging. It may sound unorthodox, but the result was a collection of bold food-related slogans such as “Yum!” and “Eat Me Up!”. 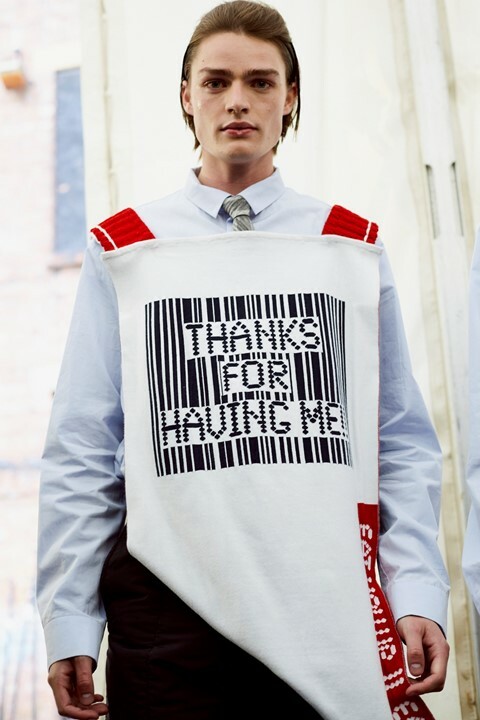 Huge, spongey silhouettes were based on boxy food cartons and dishwasher sponges, but the collection’s standout look was based around the intricate barcodes of a takeaway receipt – the tech-driven piece was entirely created by the process of digital-knit. “Collaboration is cool”, said Gayane Arzumanova when interviewed backstage. Her work proved this; she used heat-manipulated leather created by Beth Wilson and adorned each look with a dramatic headpiece by Yui Jiang. The motive behind the collection was to capture the idea of a transient moment, a notion communicated through sculptural silhouettes which appeared to have been frozen in motion. 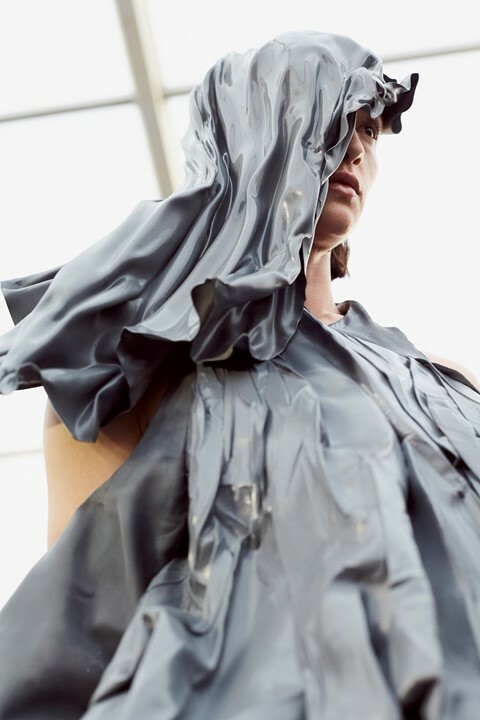 Ruffles cascaded down the bodies of models like waves, whereas silhouettes were largely deconstructed – one excellent example was a dress which looked to have once been a marbled leather jacket. The results were staggeringly technical; Wilson spoke passionately about the process of heat manipulation, which she was drawn to after researching conspiracy theories surrounding 9/11. These theories led her to investigate the effects that temperature could have on a surface and resulted in a series of beautifully abstract fabrics that seemed to melt onto the runway. The starting point for Sam Thompson and George Oxby’s collection was observational rather than conceptual. The designers had started to notice ways that stance and posture affect the shape of a garment; in response, they decided to create clothing that would instead command the body to conform to its silhouette. The duo created “clothes with a pre-defined attitude” through exaggeration. Proportions were enormously blown-out; knitwear was elongated with extended trailing sleeves, the hemlines of wide-leg jeans dragged on the runway and one particular MA-1 bomber jacket was super-sized beyond recognition. It was this collection that was awarded the Collection of the Year award at the end of the show.